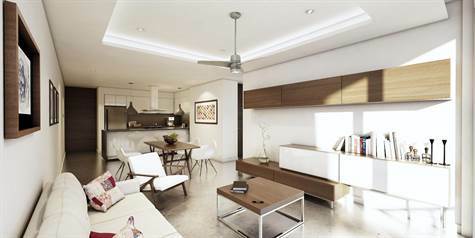 Excellent apartment for investment in Playa del Carmen. Playa del Carmen is a fascinating city that attracts more than 5 million visitors a year, from all countries of the world. Because of its proximity to the International Airport of Cancun and Tulum, the fashionable place, and being the center of the Riviera Maya, it is the perfect starting point for those who want to explore and experience the Caribbean Sea. Exclusive department with avant-garde style. It arises from the attraction and beauty of the Caribbean Sea: undulations, light curves, unique colors such as turquoise and depth full of color and life. Its avant-garde design based on organic fractures mixes, with an excellent balance, elegance, freshness and modernity in each of its details. Automation of air conditioning control, music lights.